What Types of Shrubs Are There to Choose From? Kalmia latifolia 'Clementine Churchill' is a mountain laurel cultivar. Homeowners new to the task of plant selection may be overwhelmed by all of the types of shrubs there are to choose from. With so many choices available, how does one know where to begin in making an intelligent selection? An organizing principle -- plus some guidance from someone (namely, yours truly) who has been buying shrubs for decades -- may furnish just the help that you are seeking. Do you want a type of shrub that has showy flowers? Then you will want to make your choice from within categories #1 and #2. Or do you place more emphasis on having a shrub in the landscape that provides some visual interest at all times of the year? In that case, you will find your ideal shrub either in category #2 or category #3, because it is the evergreen shrubs that hold onto their leaves throughout all four seasons. Notice that #2 represents something of a sweet spot, potentially offering both showy blooms and foliage that does not quit. In reality, however, the choices within category #2 that live up to this ideal can be rather limited. Let's examine those points further. Is the preference for a bush with showy flowers over one that holds onto its leaves all year (or vice versa) merely a matter of taste? Not really. Sometimes, there is a practical reason behind the preference. If you are looking to install a privacy screen consisting of living plants, then (assuming that your need for privacy does not come and go) you will want plants that keep their leaves year-round. Otherwise, neighbors would have a clear view of your property during the winter. In this instance, evergreen shrubs are a clear choice. But in other circumstances, instead of an emphasis on restricting the public's gaze, your focus may be on just the opposite: namely, on attracting attention to your landscaping. You may desire a shrub that says, "Look at me, look at me!" When it is a real attention-grabber that you want -- a specimen plant -- then you very likely want something with showy flowers. Frequently, you get a two-for-one deal with the deciduous shrubs: a floral showcase in spring and a fall-foliage showcase in autumn. Korean spice viburnum: a "triple threat," sporting flowers in spring that are fragrant as well as pretty, plus nice fall color. 'Blue Chip' butterfly bush: makes your property the go-to spot in the neighborhood for colorful butterflies; listed as a non-invasive type. 'Goldflame' and 'Gold Mound' spireas: do not forget the importance of spring foliage! Stewartstonian azalea: an example of a broadleaf evergreen that gives you both a spring display of flowers and good fall color. 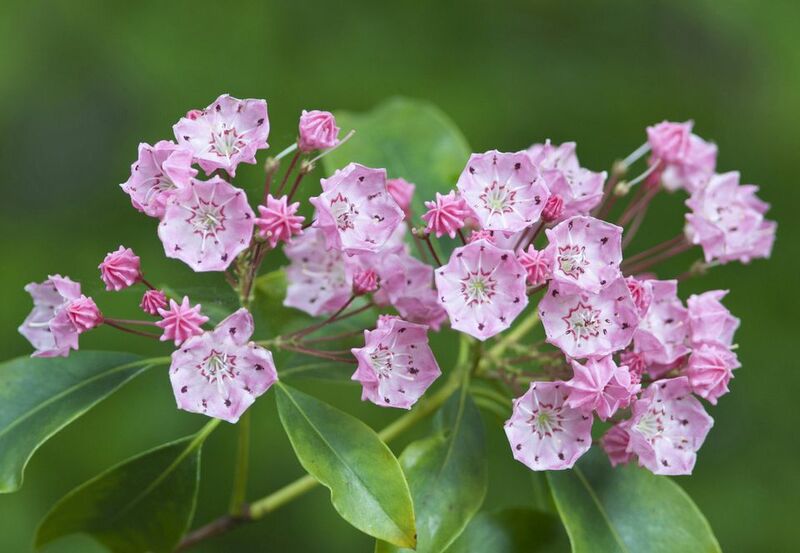 Mountain laurel: native-plant enthusiasts of the Northeastern USA will appreciate it as "one of their own," with showy flowers, to boot. Holly plants: an essential shrub for those in love with "all things Christmas". Yew bushes: a plant that you can grow just about anywhere, thanks to its toughness. Canadian hemlock: grown as a shrub rather than as a tree, it can be used to make an outstanding privacy hedge. 'Gold Mops' false cypress: Why settle for green when you can have gold?. But there is another way to categorize shrubs that may be more intuitive for some readers. While botanists work hard at classification systems that are necessary for science, everyday people will often classify plants according to their use in the landscape. For example, some shrubs may be great for hedges, others for fall color. The various types of garden shrubs available (and their uses) are discussed more fully in this article on landscape shrubs. The links in that article will take you to pages with more detailed information about each type of shrub.